The Institute is leading the way in advancing precision healthcare for infants and children through genomic and systems medicine research. Discoveries at the Institute are enabling rapid diagnosis and targeted treatment of critically ill newborns and pediatric patients at Rady Children’s Hospital-San Diego and partnering hospitals. The vision is to expand delivery of this integrated translational research process to enable the practice of precision pediatric medicine at children’s hospitals across California, the nation and the world. RCIGM is a subsidiary of Rady Children’s Hospital and Health Center. A world-class team of researchers at the Rady Children’s Institute for Genomic Medicine has engineered a Rapid Precision Medicine (RPM) program that is decoding rare childhood diseases using rapid Whole Genome Sequencing (rWGS) to enable early diagnosis and targeted medical treatment of the most fragile young patients. The Institute is scaling up the RPM program and expanding the use of rWGS to children’s hospitals nationwide. The goal is to make genetic screening fast, easy and routine for diagnosing and managing care of critically ill babies and children everywhere. Scientists at the Institute have compressed the time needed to decode rare genetic disorders in newborns through DNA sequencing to less than a day. 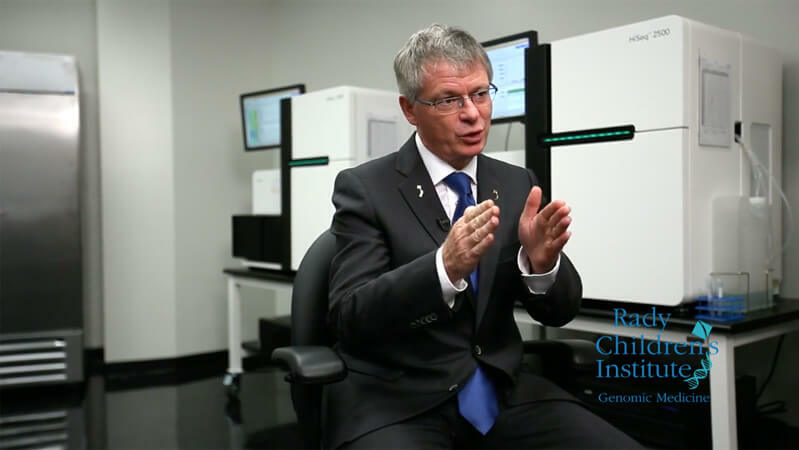 Through close collaboration with leading technology and data-science developers — Illumina, Alexion, Clinithink, Edico Genome, Fabric Genomics and Diploid—the RCIGM team has engineered a seamless process—enhanced by in-house expertise—to deliver analysis and interpretation of life-threatening genetic variations in just 19.5 hours. The GUINNESS WORLD RECORDS™ title was achieved on Feb. 3, 2018. The previous speed record of 26 hours was set in 2015 by Stephen Kingsmore, M.D., D.Sc., president and CEO of Rady Children’s Institute for Genomic Medicine. Dr. Kingsmore has pioneered the rapid turnaround and delivery of genetic test results to neonatal and pediatric intensive care (NICU/PICU) physicians. Enabling the prevention, diagnosis and treatment of childhood diseases through genomic and systems medicine research.